Thanks Brandi...and guess what I uploaded the pic first time....miracles do happen. As always great work...Thank you. Hi Brandi! Imagine my surprise that I had a pretty av waiting for me after hardly ever coming on the forum. (Facebook - more like Yoville - has totally sucked me in lately ) It was so sweet of you to think of me. I love how the kitty looks with the falling leaves. I am so please you found yourself. 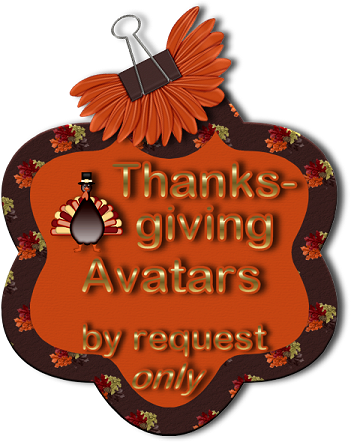 Christmas avatars are gonna be posted on Dec. 1. Check back for yours! Sorry Brandi!!! I had changed my avi last night to get rid of the Halloween....and afterwards noticed your post. I do like the one's you created for me....pilgrim especially. Thank you..but maybe I will just wait until the Dec 1 and decorate the new avi that I have...if that is OK with you. I apologize, as if I would have taken notice....would have just changed it. Been away for awhile so out of the loop. I feel nekkid without the helmet but well, a gals gotta do what a gals gotta do to dress up huh? Brandi ~ You have the cutest little monkey smileys! I keep trying to catch them as you post them, but I'm on my laptop, and don't have my Photobucket password saved! But they sure are cuties! I make them in between working on avatars when I get an idea for one. Let me see what I can come up with for you for Christmas! I'll probably have several designs for you to choose from. Page created in 7.955 seconds with 19 queries.